1 pcs. - 5 pcs. 11.64 GBP / pcs. 6 pcs. - 20 pcs. 7.68 GBP / pcs. 21 pcs. - 100 pcs. 5.70 GBP / pcs. 101 pcs. - 499 pcs. 4.92 GBP / pcs. 500 pcs. - 999 pcs. 4.56 GBP / pcs. from 1000 pcs. 4.08 GBP / pcs. 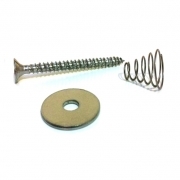 Our individually engraved metal tree labels are supplied with a single fixing hole and the spring, screw and washer “tree label fixing kit” necessary to fasten your labels to mature trees or posts. 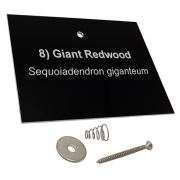 They are manufactured in house from a highly durable, engraving metal. This material is a UV stable aluminium, which means your labels will withstand normal weather conditions for years to come. 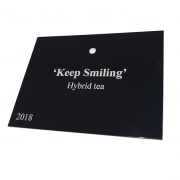 These labels are 75mm x 50mm x 1mm and can be supplied in Gloss Black Aluminium or Matt Silver Aluminium and engraved with up to three lines of text. 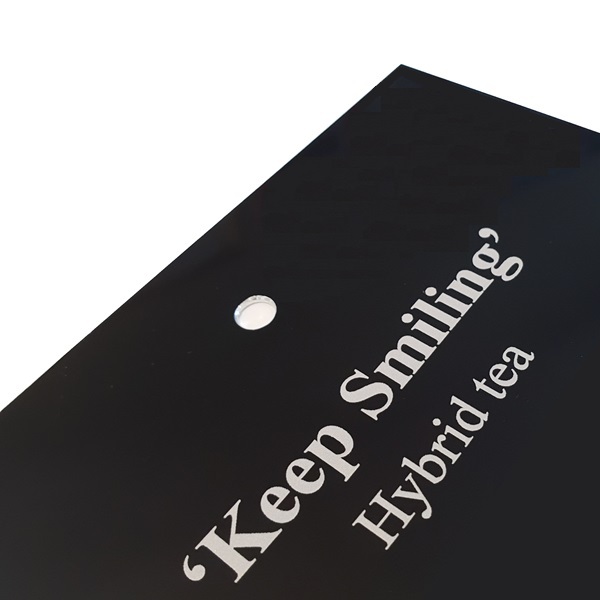 Should you wish to include more text, then we charge an additional 20p per extra line, per label. 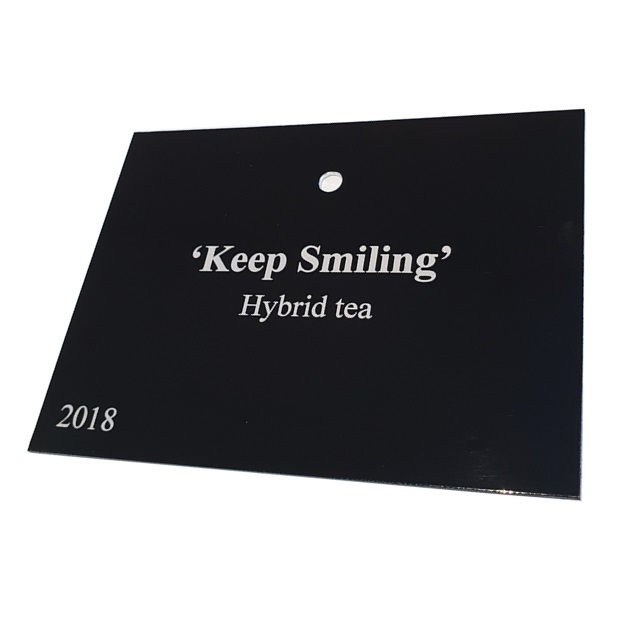 Please note that we can engrave all labels with different text, if required. 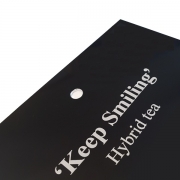 To place your order select the metal type you require, the font style and text you would like engraved. Then add the quantity of labels you wish to purchase and add them to your cart. Option 1: Upload your own text instructions in either a JPEG, Coreldraw, Word or Excel format. Option 2: Download one of our blank Word or Excel templates, edit them to suit your specifications, then upload them in the section below. Option 3: Or simply type your instructions onto the page (which will be delivered to us, with your order). We arrange for all text to be centered on labels. If you would like your text to be aligned differently, please specify in the order notes section during checkout. Alternatively, you can email us your engraving instructions (in either a Word or Excel format, please. Once we have received your order, we will send you an email with your label artwork attached. Please note we do not offer a spell or grammar checking service. So, please ensure that the information you send us is correct. Once artwork has been submitted we will allow a maximum of one revision to be made. Further revisions to artwork will incur a charge of £5 + VAT. Only once you confirm your acceptance of the artwork, will we produce your labels. Tree Label Fixing Kit to display tree labels to mature trees. Engraved Metal Tree Label 100mm x 75mm. Supplied with Tree Label Fixings.